Dejero Control is a cloud-based management system that gives you the power and flexibility to centrally manage your Dejero equipment from a web browser. routers, receivers, and Cloud Servers. 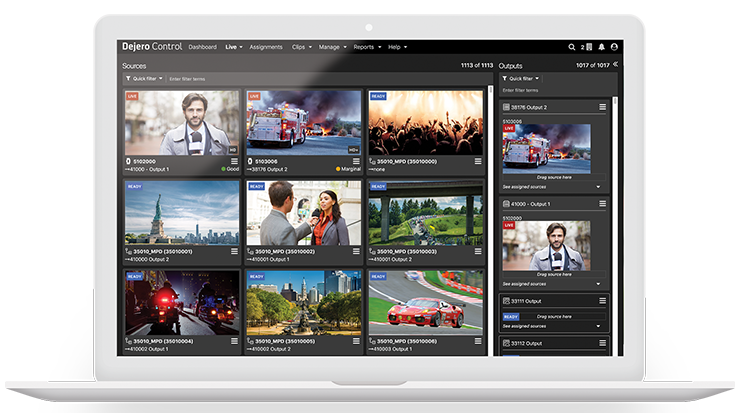 Use Control to view performance data, preview low-latency feeds, and route your live or recorded content to playout and online delivery workflows. We simplify the routing and sharing of live video feeds, recorded clips, and file transfers from transmitters to receivers or Cloud Servers. Content can also be routed to multiple destinations. Dejero customers can share their transmitters and receivers with each other to immediately expand their coverage of breaking news or live events. Remotely control transmitters, anywhere in the world. Technicians at the broadcast facility can adjust settings and troubleshoot so your field crew can focus on getting the shot. Track detailed shot information across all connections with real-time live stats. Generate customized reports for further analysis. Control Standard is included with your purchase of Dejero equipment. To realize the full power of Control, upgrade your license to Control Enhanced. Looking for a printable copy of the Dejero Control product brief?